Gerontology is a multidisciplinary field focused on the physiological, psychological, social and cultural factors that impact human aging. Unlike geriatrics ― the medical field dealing with treatment methods for elderly patients ― gerontology is not strictly limited to healthcare. Other areas of interest for gerontologists include economics and finance, social services, geography, politics, law and public policy. Gerontology graduates often find work in medical health and services management, occupational therapy, adult care, social work, and research. A large number of professionals in this field begin their career by earning a master's degree in gerontology. Some of these master's programs are concentrated in gerontology; other pathways allow students to earn a gerontology degree specialization in master's subjects like public health or social services. In addition to standard coursework, gerontology degree programs often require students to receive supervised onsite training from experienced professionals as part of a practicum course; a capstone or master's thesis project may also be included. Many of today's students are choosing to earn their master's degree in gerontology online. Web-based students follow the same rigorous curriculum as their brick-and-mortar counterparts, leading to the same number of job opportunities for successful graduates. The asynchronous (or self-paced) schedule and study-from-home format are also ideal for students with part-time jobs, childcare duties and other obligations that may conflict with on-campus learning. Learn more about what you can do with an online master's in gerontology and what kind of career opportunities you can look forward to with this comprehensive guide. WILL AN ONLINE MASTER'S IN GERONTOLOGY PROVIDE ME WITH THE SKILLS I NEED TO ADVANCE MY CAREER? A master's in gerontology will prepare students for a wide range of professional settings. Those pursuing a career in academic or medical research will learn how to collect, analyze and evaluate data related to different aspects of human aging. A gerontology in master's track is also suitable for students who plan to work in fields like social and community based services, counseling and health management; the best online master's in gerontology programs will cover certification and licensure requirements (such as exams and/or residency hours) related to these career paths. WILL AN ONLINE MASTER'S IN GERONTOLOGY PROGRAM WORK WITH MY SCHEDULE? Online master's in gerontology degree programs offer a flexible, easily accessible alternative to traditional college education. Students can download course lectures and readings, participate in virtual discussions with other students, submit written assignments, take exams and communicate with their professors on their own schedule. Current technology also enables them to study away from home using a laptop, tablet, smartphone and other portable devices with Wi-Fi capabilities. For added convenience, online gerontology master's students can usually coordinate practicum courses at facilities that are reasonably close to their current residence. WHAT JOBS CAN I GET WITH MY MASTER'S IN GERONTOLOGY? Students who graduate with a master's in gerontology online will be qualified for many different occupational roles. Some of the most common job titles for gerontology degree-holders include medical and research scientists, medical health and services managers, occupational and recreational therapists, adult care specialists, social workers and postsecondary teachers. The master's in gerontology will also equip students with the knowledge and skills needed to succeed in a Ph.D. or doctoral gerontology program. 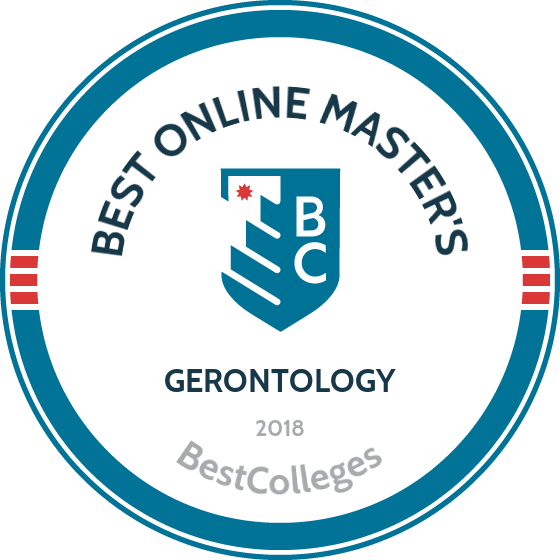 WHAT ARE THE BEST ONLINE MASTER'S IN GERONTOLOGY PROGRAMS? Choosing a program is an incredibly personal decision, and only you can properly evaluate whether a target school's strengths match your educational needs. The following ranked list of schools should serve as a helpful starting point in your search for the best online MBA in healthcare management programs in the United States. If you are considering an online MBA in healthcare management, be sure to contact admissions specialists at different colleges and universities to learn more their about specific requirements and offerings. Launched in 2014, UF Online offers 19 degrees entirely online, including a 36-credit online gerontology master’s degree. Designed for working professionals, the program combines live coursework with asynchronous sessions that allow students to continue working full-time while earning their degrees. Distance learners earn their degree in as little as two years without ever having to travel to northern Florida. The university does not require clinical experience to enroll. UF’s master’s degree in gerontology focuses on the aging process from psychological, physiological, emotional, sociological, and clinical perspectives. Sponsored by UF Health, the program readies participants for careers working with a growing geriatric population. The university accepts applicants year-round, with start dates in spring, summer, and fall, and offers the same tuition rates to students living inside of and outside of the state. Opened in 1891 as the nation’s first unified public medical school and hospital, the University of Texas Medical Branch includes schools of medicine, nursing, health professions, and graduate biomedical sciences. The Galveston-based institution hosts an MS in nursing that offers students the choice of two nurse practitioner tracks: gerontology acute care or gerontology primary care. Both online master of science in nursing tracks allows students to earn their degrees with “minimal visits” to Galveston. Distance learners earn most of the 49 required credits asynchronously, but the program also includes more than 700 hours of clinical work, which students can elect to perform locally. UTMB selects applicants based on GPA performance, work experience, publications, life experience, and community service. Candidates must also submit a personal statement and a letter of reference. Graduate students may transfer up to 12 credits, and UTMB assumes students already possess a registered nurse license prior to applying. GW Online offers an online master’s in gerontology in tandem with its nurse practitioner program. Students enroll in the master of science in nursing and select the adult gerontology primary care nurse practitioner track. They can pursue the 48-credit program largely online through asynchronous coursework either part-time or full-time. GW does require visits to Washington DC and 625 hours of clinical practice, which participants can do in their communities. The curriculum emphasizes critical thinking and problem solving and integrates policy, research, technology, simulation, and hands-on nursing. Graduates of GW Online’s AGPCNP programs sit for the American Association of Nurse Practitioners (AANP) or American Nurses Credentialing Center (ANCC) certification exams for the Adult-Gerontology Primary Care Nurse Practitioner credential. Applicants must hold an active nurse’s license and submit undergraduate transcripts, two letters of recommendation, a current resume, and a personal statement. GW prefers candidates with a GPA of 3.0 or better. USC is a renowned private research university in Los Angeles. The school was an early proponent of distance education, and remains a pioneer in optimizing digital media technology to deliver its online degrees. At USC, aspiring gerontologists can pursue five different master's degrees and a graduate certificate program. The school’s gerontology program prepares candidates for careers focused on research and policy. Online gerontology courses examine aging as a societal phenomenon, and cover how to write grants and conduct research in the field. The MS program is augmented by a practicum experience. USC's online master's in gerontology is geared towards professionals in social work, public health, and related arenas that cater to the needs of aging adults. Other available graduate programs include: Master of Arts in Gerontology, Master of Aging Services Management, Master of Long Term Care Administration, Master of Science in Nutrition, Healthspan and Longevity, and graduate certificate in gerontology. Purdue offers a hybrid master’s in gerontology online that runs most classes asynchronously. The university does, however, require several mandatory classroom components that meet on campus. Purdue splits the 46-51 credit curriculum of its master of science with a major in nursing and adult gerontology primary care nurse practitioner specialization into four sections: a 14-credit graduate nursing core, 15 credits in advanced practice nursing care, 16 credits in adult gerontology primary care nurse practitioner specialty courses, and 1-6 credits for a master’s capstone. Students either write a thesis or create a portfolio and must complete 630 clinical hours. They can concentrate their studies even further with a research focus in healthcare delivery systems, chronic care delivery, promotion of wellness, or nursing education. Candidates possess both licensure from Indiana and a bachelor’s in nursing. Applicants must submit undergrad transcripts which show both a 3.0 or better GPA and at least one statistics course completed sometime in the last five years. Michigan State offers several professional programs through its ecampus, including a master of science in nursing adult gerontology clinical nurse specialist focused on leadership. The program gives advanced-practice nurses the skills and expertise to teach others, and graduates sit for the gerontology certification exam offered by the AANC. Students can pursue the 47-51 credit curriculum while working full-time and most take 3-9 credits per semester. Instructors deliver coursework asynchronously for maximum convenience and the school requires only one visit to Michigan for an orientation session at the outset. Applicants must hold a registered nurse license and possess a bachelor’s degree in nursing, preferably with a 3.0 GPA or better. MSU charges a flat-rate tuition to all distance learners. U Online hosts an online master’s in gerontology through a blended format in conjunction with the college’s School of Nursing. Distance learners complete most required coursework asynchronously, but the school does expect participants to complete a 150-hour practicum at one of its approved sites. The curriculum of the master of science in gerontology interdisciplinary program consists of 33-34 credits, depending upon whether degree seekers elect to complete a master’s thesis or a master’s project. Students accrue 21 credits in required core courses, six-to-nine credits in electives and the remainder in their thesis or project. Those enrolled full-time typically complete their studies in two years -- part-timers in three. Candidates must submit collegiate transcripts, a current resume, three professional recommendations, and a goal statement. Founded as a medical school in 1824, TJU offers a master’s degree in gerontology online through its College of Nursing. The adult gerontology acute care nurse practitioner program equips nurse practitioners to provide the full spectrum of care to the aging and critically ill population. The curriculum comprises 18 credits divided between the core master of science in nursing requirements and the gerontology specialty. Students earn a full nine credits studying diagnostic reasoning and clinical decision making, and they typically conclude their studies with a 3-credit comprehensive assessment. Applicants must hold an RN degree and a bachelor’s in nursing with a 3.2 GPA. Additionally, applicants need a B grade or better in BSN-level courses that cover nursing research, physical assessment, and statistics. Iowa State hosts an array of web-based programs through its Online and Distance Learning department, including a master’s degree in gerontology online offered in partnership with the Great Plains Interactive Distance Education Alliance (IDEA). Students take the multidisciplinary and interactive master of science in gerontology entirely online. Students must accrue 24 credits in master’s core courses and an additional 12 in thesis or elective course work. The program explores not just the physiological changes that come with aging, but also how older people relate to their families, communities, and society. Great Plains IDEA offer all courses asynchronously, and students generally complete the program within two years. Iowa State allows students to take up to nine credits before enrolling. Admission requires the submission of college transcripts, a resume, three letters of recommendation, and a goal statement. Nova Southeastern’s online master’s in gerontology program encourages graduates to fight against ageism in society. Inspired by the belief that life holds meaning and purpose at all ages, NSU’s curriculum explores how the lives of the elderly can be enhanced or impaired by the world we live in. Leadership skills are an essential part of each core course, as are real-world applications. Core courses include emergency preparedness, gerontology and the family, public health, and more. Graduates are well-suited for management positions in the human services or senior housing industries. Students may also be interested in the school’s six-course graduate certificate in gerontology. NSU is a large private school based in Fort Lauderdale, Florida, with regional campuses located throughout the state and in Puerto Rico. NSU began as a technical school, and the university remains committed to providing a quality education for working professionals. Classes are taught asynchronously, and students do not ever need to commute to campus. NSU can also help students facilitate internships. Drexel’s College of Nursing and Health Professions hosts an online master’s degree in gerontology that prepares nurses for certification as adult gerontology primary care nurse practitioners. The program includes three visits to Drexel’s campus in Philadelphia, and students who successfully complete the program sit for the ANCC or the AANP certification exam. The curriculum requires students to complete 52 total credits for graduation, including five core courses, five support classes, and five clinical courses that put distance learners in senior-care situations. Mandatory on-campus residencies range from 2-3 days and take place during the second and third year of the program. Applicants must submit college transcripts, two professional references, a personal statement, and a resume. Preferred candidates possess a 3.0 GPA and at least one year of work experience. The University of North Dakota offers students a master of science -- adult-gerontology primary care nurse practitioner hybrid program. The 52-54-credit curriculum emphasizes the process of aging, and how it changes the needs of patients over time. Graduates earn experience necessary to take the AANP or ANCC gerontology certification exam. UND requires program participants to make four, one-week visits to the university’s Grand Forks campus for residencies, and students can complete the 600 hours of clinical practice in their own neighborhoods. Many of the program’s online courses also utilize live meetings at scheduled times. Requirements for admission include a bachelor’s in nursing from an approved school, a resume, an active nurses license, a background check, and a minimum GPA of 3.0 for the last two undergrad years. The university prefers at least one year of work experience, and all distance learners pay in-state tuition rates. Concordia designed the curriculum of its master of arts in gerontology as an interdisciplinary program aligned with the standards set by the Association for Gerontology in Higher Education. The 33-credit, two-year degree introduces students to the best practices of gerontological education and research. Participants complete all coursework online, but Concordia does require a 16-week practicum in a community agency serving older adults. Coursework focuses on adult development, diversity, ethics, sociology, public policy, and death and dying. Students conclude the program with a capstone seminar in which they complete a thesis or an applied project and present it for peer review. Applicants must submit their undergraduate record, a goals statement, and two letters of recommendation. Concordia offers distance learners a flat fee and a guarantee that tuition rates will not rise during the time it takes to complete the degree. Texas Tech hosts a master’s degree in gerontology online as part of its family and human development major. The Lubbock institution aims the program at working professionals and offers the degree as part of the Great Plains IDEA consortium of colleges. These seven universities developed the curriculum to prepare graduates for work in senior centers, nursing facilities, counseling centers, rehab centers, and other agencies that provide services to senior citizens. To earn their degrees, students complete eight core classes and four electives totaling 36 credits. Electives in subjects like mental health, physical activity, and spirituality enable participants to tailor their program to their career goals. Faculty teach every class in an asynchronous format using email, chat, and discussion forums to interact with distance learners. Distance learners pay in-state tuition rates. Students at Concordia University-Nebraska have multiple online graduate-level study options in gerontology. The MS in gerontology and aging studies program delivers instruction on natural lifespan development, linguistic issues common in this population, and the psychosocial environment elder adults must navigate. In the administration concentration, students focus on issues related to managing elder-care facilities and events. In the mental health concentration, students examine the biological changes that affect the brain and their applications in counseling. Professionals who aspire to careers in long-term care can also pursue an online master of healthcare administration with a concentration in gerontology. The program's curriculum emphasizes business skills essential to health care administration, and their particular applications in the senior long-term care industry. This accelerated program can be completed in two years. All online courses are taught asynchronously. Distance learners can arrange to complete practicums at a local facility; they are not required to commute to campus. Founded in 1937, Seton Hall was the first Catholic college on the East Coast to open a nursing school. The school offers an online gerontology master’s degree with specializations in acute and primary care. The curriculum of the master of science in nursing program focuses on analysis, evidenced-based care, and close mentoring faculty relationships. Graduates leave ready to take the gerontological certification exams of the ANCC and AANP. Both tracks require students to earn 48 credits and most students complete the program in 3-4 years on a part time basis. During the course of their studies, participants must complete three immersions: the first on campus as a sort of orientation and the second two as hands-on practicums. The program carries certification from the prestigious CCNE. Oklahoma State’s online master’s in gerontology is a multidisciplinary major offered in conjunction with six other universities in the Great Plains IDEA program. The master of science in human development and family science: gerontology curriculum gives students an understanding of the physiological, social, and mental stages we go through as we age. Subjects covered include health and nutrition, public policy, economics, and statistics. Typical participants take one or two courses per semester for three years through coursework delivered asynchronously. The program does not lead to certification. The 36-credit curriculum opens with a professional seminar and ends with a capstone project. Oklahoma State does not require students to travel to Stillwater at any point. Applicants must submit a resume, previous college transcripts, three letters of recommendation, and a goals statement. The university does not require the GRE for the program. Graduates from McDaniel College's online MS in gerontology program leave school prepared for leadership roles in industries that support our elder population. This program delivers the knowledge necessary to improve the quality of life of older adults from all walks of life. The curriculum explores the biological and psychological aspects of aging, bolstered by study of research methodology and its applications. The program culminates with either a thesis or research project of your choice. Located in Westminster, Maryland, McDaniel is a small private liberal arts school that serves the Baltimore and Washington, D.C. area. Though the college has fewer than 700 full-time graduate students, master's candidates have a number of scholastic options. In addition to the MS in gerontology, students who are interested in the field can also pursue a graduate certificate in gerontology, or the five-year BA-to-MS program. Graduate students can complete all degree requirements online, attend classes on campus, or combine the two in a hybrid format. All online master's in gerontology classes are taught asynchronously, and feature the same small class sizes McDaniel is famous for providing. Based in the city of Denton, the University of North Texas offers an online master’s in gerontology as part of its MS in health services administration, a gerontological degree with an administrative bent. Students take the 36-credit curriculum entirely online in courses that instructors deliver asynchronously to allow learners to continue their jobs. The program splits the curriculum between 24 credits of core coursework and 12 credits of the applied gerontology specialization. The program emphasizes management and healthcare topics like health information systems, financial issues in healthcare, and healthcare laws and ethics. The capstone that concludes the program requires students to complete a research project and present it for review. Applicants must submit transcripts, a resume, two letters of reference, and a personal statement. The University of Texas at Arlington’s master of science in nursing offers gerontology specialties in both acute and primary care nurse practitioner. Both require 41 credits to graduate and typically take distance learners two to three years to complete. Applicants must live in Texas, hold a valid RN license, and possess two years of experience in the field. UTA recommends that participants in both tracks of the MSN master’s degree in gerontology online allocate at least five hours per credit. The program includes several weeks of clinical practice and a 13-week practicum preceptorship. UTA offers a flat fee for these distance programs in addition to a no-hike guarantee. Applicants must submit college transcripts with a 3.0 GPA and a resume. The university accepts as many as ten hours of transfer credit. A small private school in Gainesville, Georgia, Brenau offers a customizable online master’s in gerontology through its department of psychology. Because the degree brings together a variety of disciplines, students can use electives to create a course of study that matches their individual career goals. Brenau’s master of science in applied gerontology looks at aging through an array of different lenses, including psychology, business, occupational therapy, advocacy, education, legal services, nursing, and research. Students must fulfill 18 core credit requirements and use the 12 remaining electives to tailor their education to their interests. The department offers all courses asynchronously. Candidates must hold an undergraduate degree with a minimum 2.5 GPA and should have taken either intro to psychology or human growth and development. Concordia Wisconsin hosts a master of gerontology online program with a Christian perspective. Aimed at professional nurses, the 41-credit curriculum gives students a broad base of knowledge in the issues that affect the aging population. Concordia built its master of science in nursing adult gerontology primary care nurse practitioner degree around a core of nine courses followed by three terms of advanced primary care in a clinical setting. Professors deliver classes asynchronously, though the practicums do require hands-on time in an approved clinic. Applicants must submit a resume and previous college transcripts. The Mequon-based university cannot admit students from Alabama, Alaska, California, Kentucky, Louisiana, New York, Oklahoma, Pennsylvania, Puerto Rico, Tennessee, South Dakota, or Maryland. The University of Missouri hosts an online master’s in gerontology that is part of its Department of Human Development and Family Science. Delivered entirely online with no visits to Missouri required, the 36-credit degree is part of the Great Plains IDEA program. Students usually take one or two classes per semester and graduate within two or three years. The curriculum of the master of arts in human development and family studies with an emphasis on gerontology requires degree seekers to complete eight core courses, complete an independent project of three to six credits, and fulfill six to nine credits of electives. Students select either an internship or a research project and sit for an exam as the culminating event. Admissions requires a bachelor's from an accredited institution with a minimum 3.0 in the last 60 hours of undergrad education. Loyola’s master’s degree in gerontology online provides nurses with a specialty in both oncology and in gerontological studies. The program provides advanced practice nurses a rigorous education in working with older adults suffering from cancer and the chance to gain first-hand experience in clinical settings. The 48-credit curriculum of the master of science in nursing adult-gerontology clinical specialist with oncology specialty program takes professional nurses through four core courses, eight advanced specialty classes, and four courses in oncology care. Students also complete a 12-credit clinical care practicum during the last semester of the program at an approved location convenient to the student. Candidates must hold a valid nursing license and submit their academic transcripts, a resume, and three letters of recommendation. Set in the city of Fargo, North Dakota State offers a host of web-based degrees through its Distance and Continuing Education cyber campus, including an online gerontology master’s degree. The 36-credit program takes students through all phases of the aging process, and students typically complete the degree in two or three years. Seven universities built the IDEA curriculum of the master of arts in human development and family studies with an emphasis on gerontology around eight core courses. Participants complete an independent project of three to six credits and fulfill the remaining credits with electives. Additionally, learners can opt for an internship or a research project for their final project. Everyone sits for the comprehensive exam. Admissions requires a bachelor’s degree with a minimum 3.0 in the last 60 hours of undergrad education. How Long Is an Online Gerontology Program? Accreditation will vary by program. Some will receive programmatic accreditation from the Association for Gerontology in Higher Education (AGHE), or other related agencies like the Council on Social Work Education (CSWE) Commission on Accreditation (COA) or American Psychological Association Commission on Accreditation (APA-CoA). Others will receive regional accreditation through the college or university where the program is offered. The demand for qualified gerontologists has risen in recent years, largely due to the aging baby boomer population; according to the Administration for Community Living (ACL), there are roughly 46.2 million elderly men and women (age 65 and older) currently living in the United States. This number is expected to double between 2015 and 2055. As a result, the employment outlook for gerontology-related professions is currently quite strong. Using data from U.S. News & World Report, the following table looks at unemployment rates for some of the most common careers among gerontology degree recipients. Source: 'Best Health Care Jobs', 'Best STEM Jobs' and 'Best Social Services Jobs' by U.S. News & World Report. Of the six professions listed in the table, the average unemployment rate is 2.4%. This figure is significantly lower than the national unemployment rate for all industries, which currently sits at 4.6%. According to the 2015-16 PayScale College Salary Report, students who graduate with a master's in gerontology earn a median annual salary of $46,000 during their first five years in the workforce and $60,600 once they hit the 10-year mark. This amounts to a 31.7% earnings increase after their first decade on the job. By comparison, the most recent data from the Bureau of Labor Statistics (BLS) reports that the median annual salary for all industries is $36,200. Like unemployment rates, however, the earning potential for gerontology master's recipients will largely depend on the degree-holder's specific job title. The next table explores career salary growth projections for some of the most popular occupations related to gerontology. All five occupations listed in the table experience a career salary growth rate of at least 23%. Retirement plan specialists reported the most substantial growth: a 66.1% increase between the entry-level and late-career stages. Medical laboratory scientists placed second with 29.4% career earnings growth, followed by occupational therapists with 26.9% growth. Students who graduate with a master's in gerontology will be qualified for dozens of top-level positions, although individual eligibility will depend on additional factors like company size and city/state of employment. Four of the most common career pathways in gerontology are detailed below. Medical Scientists: Medical scientists specialize in research rooted in human health and medical treatment. Some focus their work on epidemiology and disease pathology, while others target pharmacology, drugs and medical devices. Their most common workplaces include higher-learning institutions, hospitals, pharmaceutical and medical manufacturing centers and medical diagnostic laboratories. Social Workers: Social workers assist members of the public with various issues that impact their daily lives. Within the gerontology field, most of these professionals work directly with elderly clients to secure accessible housing, obtain medical benefits, receive medical treatment and address other important concerns related to aging. Medical and Health Services Managers: Also known as healthcare executives or healthcare administrators, these professionals oversee the various services offered at hospitals, clinics, physician's offices and other care-based facilities. Their day-to-day duties may involve medical billing and recordkeeping, equipment maintenance, facility upkeep, and staff hiring and training. Occupational Therapist: Occupational therapists assist clients with injuries, chronic illnesses and other conditions that negatively impact their daily routines. They specialize in treatment and therapeutic techniques that utilize everyday objects and activities. Making professional connections and learning about different approaches to gerontology is crucial to your success. Professional organizations offer a great entry point for students who want to learn more about their chosen career path. Below you'll find three of the country's most prominent organizations established for gerontology professionals. These organizations host networking events, provide online trainings, maintain active job boards, and offer other services for career-ready college graduates. Resources like these often prove invaluable as you complete your degree requirements and prepare to enter the job market. Gerontological Society of America: Founded in 1939 as the 'Club for Research on Ageing', the GSA today represents more than 5,500 members. The organization publishes two online journals, hosts an annual conference and offers webinars and professional development courses. International Association of Gerontology and Geriatrics: Also known as the International Federation on Ageing (IFA), this Canada-based organization boasts more than 45,000 members worldwide and 73 member organizations in 65 different countries. Membership benefits include reduced conference fees, networking events and opportunities to become part of the IFA Board of Directors. American Society on Aging: The ASA abides by a mission to "to support the commitment and enhance the knowledge and skills of those who seek to improve the quality of life of older adults and their families". Online webinars and continuing education courses are available, and the ASA honors individuals and organizations through its comprehensive awards program.